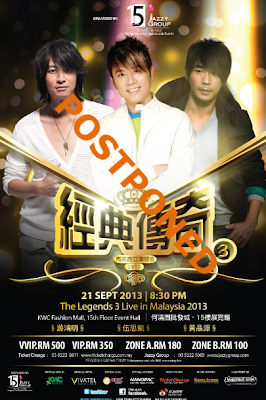 The organizer regrets to inform that “The Legends 3 Live in Malaysia 2013” concert scheduled on 21 September 2013 will be postponed until further notice. This is a difficult decision for the organizer, however, due to the circumstances beyond their control, the organizer regrettably decided to proceed with the postponement. JazzyGroup of Companies sincerely apologized for any inconveniences caused and they will announce the new show date as soon as possible. For existing ticket holders, if you wish to get a refund, further announcement regarding ticket refund will be made soon. Once again, the organizer sincerely apologized for the inconveniences caused. For further notice, you may stay tuned to JazzyGroup of Companies Facebook Page.